SUMMARY: Care coordination of the 9 million Americans eligible for both Medicare and Medicaid is a growing priority for the nation’s payors who wish to address this group’s unique medical, social and functional needs in a coordinated and cost-efficient manner. 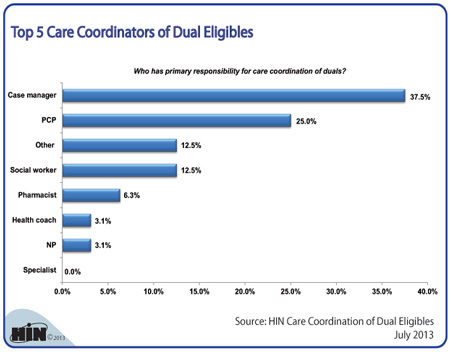 We wanted to see which healthcare professionals are responsible for the care coordination of dual eligibles. 2013 Healthcare Benchmarks: Dual Eligibles Care Coordination is available from the Healthcare Intelligence Network for $117 by visiting our Online Bookstore or by calling toll-free (888) 446-3530.